Put the World's News at your fingertips 24 hours a day. Get ahead of the world's emerging stories,All global sources in one app! Stefan de FranceWeb@Bonheur, Business Story, Culture, Style, ...et Moi, Tout a sa beauté, mais tout le monde ne le voit pas"
La vie, c'est ce qui vous arrive pendant que vous êtes occupé à faire des projets. " 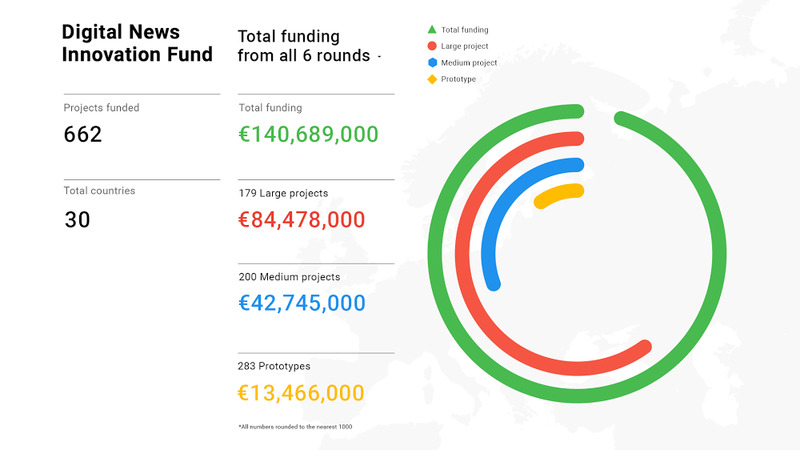 In 2015, Google launched the DNI Fund, an initiative open to publishers of all sizes in Europe that financially supports high-quality journalism through technology and innovation. 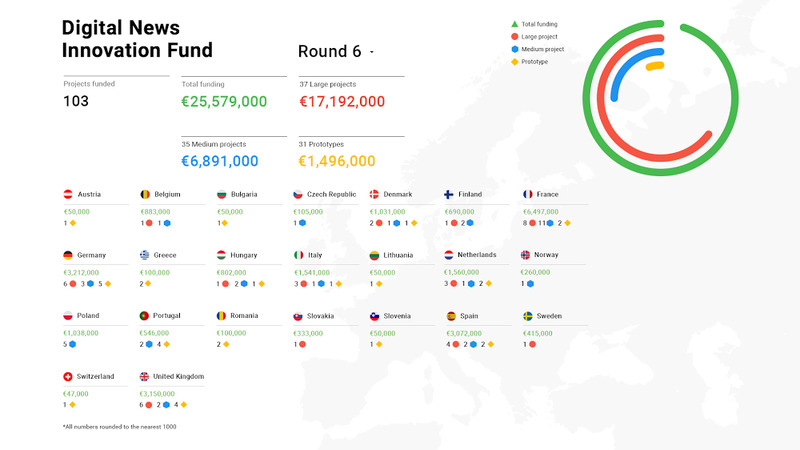 After three years and six successful rounds of funding, we’re taking a look at the impact the Fund has had on the European news scene. Today, we’re announcing the results of the last round: 103 projects selected in 23 countries and more than 25 million Euros offered. This brings the total to 662 projects supported in more than 30 countries across six funding rounds. DNI’s total funding across Europe since its launch. As with the previous rounds, we were impressed by the diversity and the quality of the projects that have been submitted. 162 of the applications came from collaborations between publishers, startups and academics. It was also heartening to see that 52 percent of applicants (351 total, about 52 percent of applicants) were newcomers to the DNI Fund. Round 6 projects, broken down by country. Once again, we asked large (up to €1 million) and medium (up to €300,000) applicants to focus on one of the most pressing issues identified by the news ecosystem: the diversification of revenue streams. We were excited to see such a wide variety of approaches from some of the biggest names in the industry alongside relative newcomers. Artificial intelligence and machine learning projects continued to be a top technology focus, and Round 6 applications demonstrated clear interest in exploring opportunities around driving subscriptions, creating new payment models and finding ways to minimize churn. Across the prototype track (up to €50,000 awards), applicants offered plenty of stimulating new thinking, with individuals, organizations and companies looking at everything from fact checking to augmented reality. The largest collaboration of publishers ever seen in France has formed a consortium and will receive €750,000 to create a Single Sign-On platform for more than 22 major media groups. This start-up company is developing a new type of participation tool for users of its “slow journalism” enterprise, which will be the digital equivalent of giving members a seat at the newsroom table. It was awarded €553,000. Digital unit of German publisher Dumont Mediengruppe will receive €475,000 to launch a gamified local rewards program. It will increase engagement and e-commerce on its local Hamburger Morgenpost site by rewarding all registered users on their sites with a virtual currency that can be used for products on their other platforms. The SAC is a collaborative project between this regional Spanish publisher and Hiberius Media Lab to develop a tool using AI and machine learning. The tool will provide real-time data-driven insights on which pieces of their published content successfully converts readers into subscribers and which retains them as engaged readers. It will receive €206,150. This Romanian journalism platform will receive €49,700 to develop revenue opportunities for its small independent member publications by building an advertisement marketplace for them to access and profit from. Stimulating innovation within the news industry takes time. We’re in it for the long haul. That’s why we launched the Google News Initiative one year ago, a $300 million commitment to help journalism thrive. As part of these efforts—and after a pilot in Asia—the GNI Innovation Challenge will roll out in Europe. For this first round, we’ll specifically look for ideas around “local” journalism, since we know that building a sustainable business model for local news is a challenge here in Europe, similar to other parts of the world. The application window for this first European GNI Challenge will open this spring. In the meantime, I invite all applicants to check our website for more information, specific dates and eligibility requirements, which will be announced soon. We look forward to receiving GNI Challenge applications, as well as continuing to learn from the news ecosystem and participating publishers.